Update: We got a reply from Airtel where it mentioned that the Incoming SMS on roaming is free of cost. 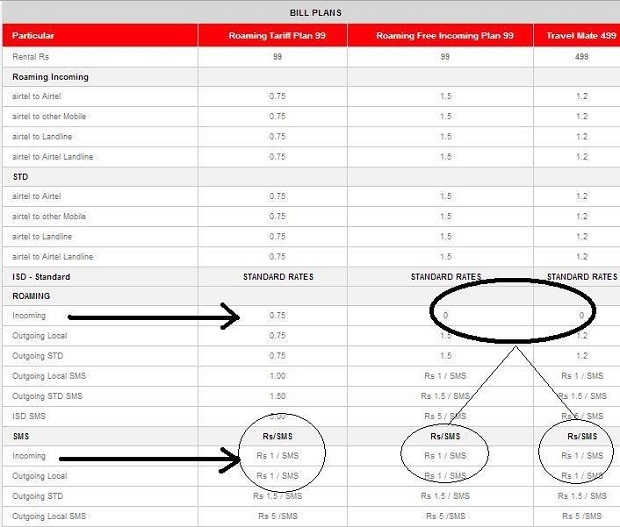 It was a human error and Airtel will make the corrections soon. “Tariffs for outgoing SMS while on national roaming which were under forbearance have been been capped: outgoing SMS-local at Re. 1.00 per SMS and out going SMS-STD at Rs. 1.50 per SMS. Incoming SMS will remain free of charge.” This is what TRAI said in Telecommunication Tariff (Fifty Fifth Amendment) Order, 2013 in respect of national roaming which was released on 17th June 2013. However, it seems that Airtel has decided to ignore it and decided to charge for the incoming SMS. At least this is what apparent from Airtel’s website. As per the order the maximum charge for SMS to a local number can be Re. 1 and for SMS to any other circle than the roaming circle it can be Rs. 1.5, but for incoming SMS there should not have been any charge. You can read the TRAI’s Press Note here. Here, there can be two possibilities, the details entered there is a human error or Airtel is actually charging for incoming SMS while roaming. If it’s the latter the Airtel is violating the TRAI order. We have contacted Airtel and are waiting for their response. We will update this article once we hear anything from Airtel regarding this. Thanks Kris Swaminathan for the tip!